Dimensions 0.82 by 6 by 9 in. Amazon.com description: Product Description: The incredibly realistic story of one family's struggle to survive the destruction of New York in a massive terror attack.Â Million-copy bestseller now in development for film by 20th Century Fox. BUT WHO IS THE ENEMY? ANDÂ WILL THEY STRIKE AGAIN? The Internet and communication networks go down...a deadly viral epidemic rages across the country...then a monster snowstorm cuts New York off from the world. Translated in twenty three countries,Â CyberStormÂ is a worldwide bestseller, a new apocalyptic disaster classic in the spirit ofÂ On the Beach,Â Alas Babylon,Â One Second After,Â Lucifer's HammerÂ andÂ PandemicÂ that will appeal to fans of Clancy, Thor, Riddle, and Hugh Howey. 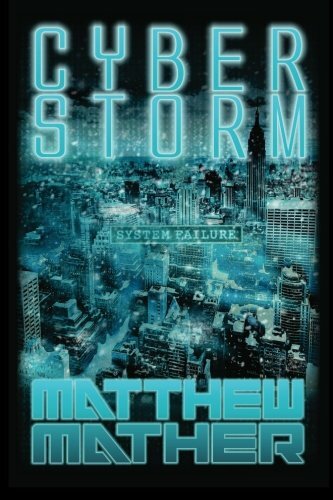 Millions of readers votedÂ CyberStormÂ into the Top 20 of its category on Goodreads, and has ranked as theÂ number one bestsellerÂ in Amazon's technothrillers, conspiracy, military, post-apocalyptic, dystopian, terrorism, and science fiction categories.